Lao Prime Minister Thongloun Sisoulith has told local authorities in the southern province of Attapeu that the government is changing the way it handles the logging business. Since Thongloun took over as prime minister in April, he has made cracking down on the illegal trade a priority for the Lao government as authorities attempt to reign in the exploitation of a natural resource. During the June 16 meeting open to reporters, Thongloun outlined for local authorities some of the changes aimed at putting a crimp in the lumber-smuggling business. Thongloun was critical of the current system that sets quotas designed to prevent deforestation, saying these make it too easy to cheat. “The ban on timber exports must restrict logging because we lost a lot of logs and timbers using the quotas,” he said. Under the quota system, timber outfits could roll the quotas over each year if their quota was unmet. If a 100,000 cubic meter quota went unmet for one year, the next year the quota would rise to 200,000 cubic meters, which could become 300,000 cubic meters the next year. “For now we will not issue logging quotas,” Thongloun said. Thongloun was particularly critical of the timber harvesting done for Lao public works projects like dams, roads, and power transmission facilities. Most forest clearing in Laos is linked to infrastructure projects. “Over the past we were lied to, with timber harvests starting with trees for dam catchment beginning at the top of the mountains and then cutting their way down,” he said. There are indications that Laos’ newfound environmental concerns are having an effect. 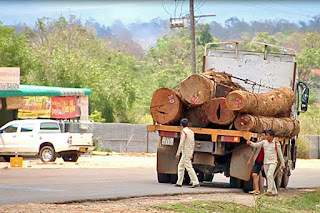 According to information from the U.K.-based Environmental Investigation Agency (EIA), smugglers are finding it difficult to spirit their ill-gotten lumber out of Attapeu province. A source in Attapeu, who spoke on condition of anonymity, told RFA on June 19 that smugglers are lying low, at least for now. “The smugglers I know aren’t moving because they are scared,” the source said. While the smugglers may be afraid, Laos has seen crackdowns come and go. “I will wait and see if the prime minister will be consistent on this issue, but many smugglers cannot export logs to Vietnam during this time,” the source said. Laos has long suffered from the rampant smuggling of logs and timber to neighbors such as China and Vietnam where the wood is used to make furniture. The government previously issued moratoriums and notices of suspension of logging activities and bans on timber exports to deal with the problem, but to little avail. A report by the Swiss-headquartered World Wide Fund for Nature (WWF) leaked online last October revealed huge increases in illegal logging in Laos. The Lao government has set an ambitious goal for rejuvenating its forests, wanting to see more than two-thirds of the country under forest cover. Estimates today set the proportion of forested land at 47 percent. Without getting control of the illegal lumber trade, Laos will never achieve that goal, Thongloun said.